First Lines: "Richard did not become frightened until darkness began to settle over the woods. In the fading light, the trees began to take on unfamiliar and menacing shapes. There was movement in the shadows. Low-hanging branches barred his path; rain-sodden leaved trailed wetly across his cheek." Back cover: He was the last-born son of the Duke of York and the last Plantagenet King. He was Richard III, a complex man living in tumultuous times. Caught in the vicious power struggle that history has called the War of the Roses, Richard had been raised in the shadow of his charismatic brother Edward. At nineteen and against all odds, Edward had defeated the House of Lancaster and claimed the English throne for York. Famous for his sensual appetites and his preference for the expedient over the correct, Edward nonetheless found in his younger brother Richard an unfailing loyal ally. Richard himself was repaid for his allegiance; he was denied nothing, except the one thing he wanted most in life--the right to wed the woman he adored, Anne Neville. Their love would haunt them both and add to the tragedy of Richard's eventual defeat at the hands of the Tudors. Sharon Kay Penman has become one of my favorite historical fiction story writers. I was first introduced to her books through her Welsh trilogy with Here Be Dragons. Her stories are full of depth and richly populated with interesting historical characters. 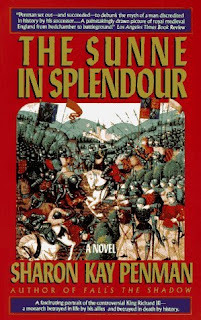 The Sunne in Splendour covers the life of Richard III over a 33 year period from when he was seven years old until after his death. From page one she immerses you in the lives of the House of York, as well as Lancaster and Neville. I enjoyed learning about Richard, his brother Edward's rise to to be King and his relationship with Richard, the War of the Roses, the intrigues as well as betrayals of the time period. History too often is rewritten with the facts being lost in the process when told from your enemies point of view. Through meticulous research, Penman set out to write a historical fiction novel that would show Richard wasn't the villain the Tudors and Shakespeare made him out to be. At 900+ pages, The Sunne in Splendour is a rich and densely packed story about 15th century England, family, power, and politics which will capture your attention and hold you there until the very end.